The Gatehouse & Interpretive Panels. 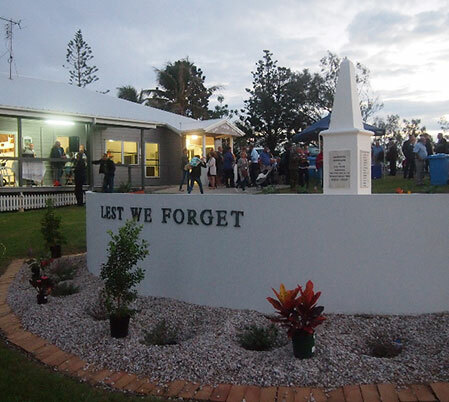 Welcome to the Emu Park RSL Sub Branch. The Emu Park RSL Sub Branch is located under the shadow of the famous Singing Ship Monument on the headland at Emu Park. Our Sub Branch does not provide meals on a regular basis; however you can have a quiet drink in our Memorial Hall. Children are welcome, however like all licensed premises the liquor act has to be observed. It doesn't get much better than sitting on our deck with friends while you look out over the majestic islands of Keppel Bay. Members and guests are invited to look around our website. You will be sure to find all the necessary information and details about our Sub-Branch. The Sub-Branch has a liquor license and is opened on Thursday 1:00pm to 6pm, Friday 5:00pm to 8:00pm, Saturday 2pm to 6pm and Sunday 11:00am to 6pm. Guests are always welcome at the Emu Park RSL. Copyright © 2019 Emu Park RSL Sub Branch. All Rights Reserved.